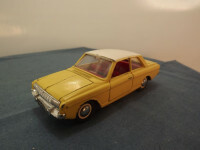 This model is the Dinky 154-H-1 Ford Taunus 17M in Yellow with white roof. 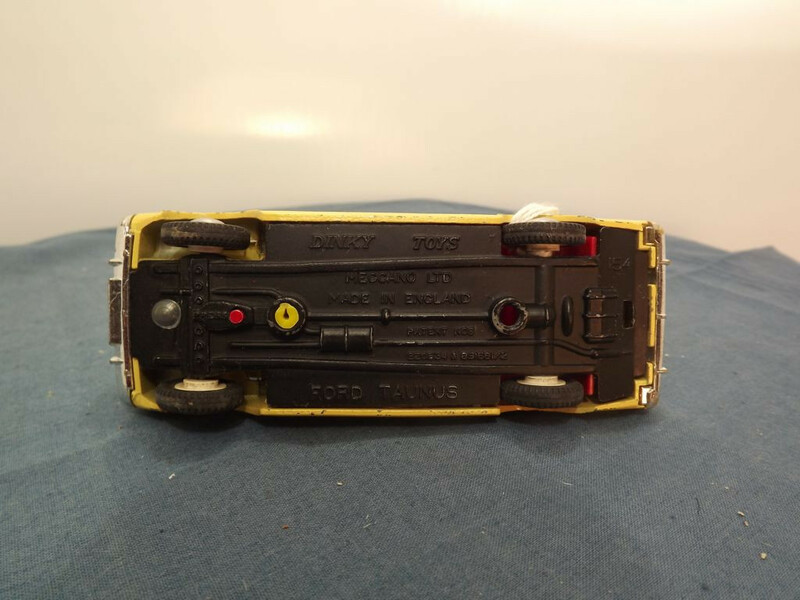 Although coded in Dr Edward Force's book "Dinky Toys" as a 154-G-1, I believe this is a misprint that has been perpetuated over the years and through 7 editions as all other second release models of this period were coded in the "H" series (e.g. 151-H Vauxhall Victor 101, 152-H Rolls Royce Phantom V, 153-H Aston Martin, 156-H Saab 90, 157-H BMW 2000 Tilux, 158-H Rolls Royce Silver Shadow, and 159-H Ford Cortina MkII). The model features opening doors which reveal the red plastic interior. This model has a Left Hand drive, black plastic steering wheel. The grille, headlights and front and rear bumpers with number plate [UVR 576B] are silver plated plastic attached to the metal body. The tail lights are painted red. The model also has opening bonnet, activated by a small red button on the base, that reveals the silver painted engine, and opening boot. The model has glazing on all windows except the opening front doors and the windscreen had been molded to show windscreen wipers and the rear vision mirror. The baseplate is black metal in the centre top of which is "Dinky Toys". Below this,above the driveshaft is "Meccano Ltd, Made in England" on two lines. Below the driveshaft are the patent details, "Patent Nos, 920534&891681/2". At the centre bottom is "Ford Taunus". "154" is cast to the rear top and the word "Press" is cast immediately before the red bonnet operating button. The base also carries a rudimentary representation of the driveshaft, exhaust system and suspension. All wheels are of the cast plastic type - solid one piece plastic hubs, with a press fitted hub cap and separate black "rubber" tyres. 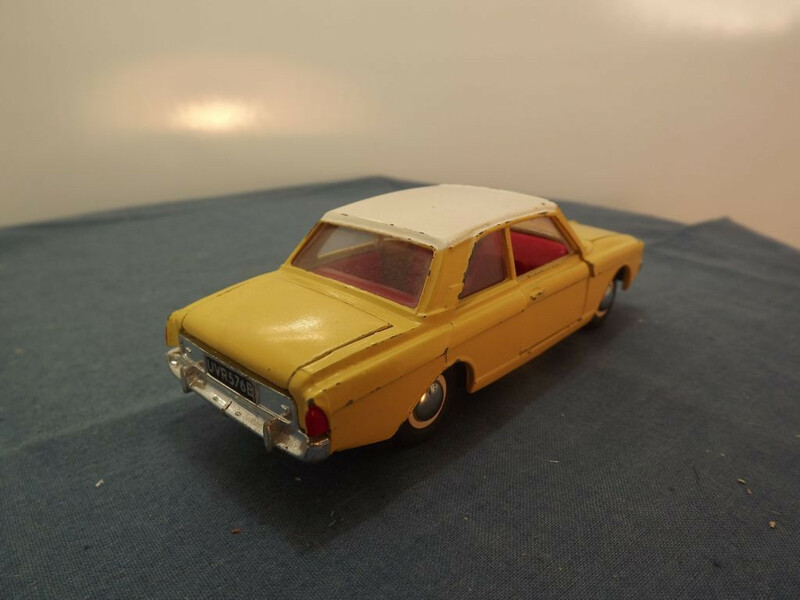 This model was issued between 1966 and 1968.